U.S. News & World Report today named Vanderbilt University as one of the best universities in the country as part of the publication’s annual rankings of top universities. Vanderbilt rose to 14th place this year, its highest ranking to date, after holding at No. 15 the two previous years. The best-ever showing culminates a steady rise by Vanderbilt, which was ranked No. 18 in 2005, No. 20 in 1997 and No. 25 in 1992. This recognition is a testament to our students’ academic excellence, our faculty’s deep commitment to world-class research and an unparalleled dedication to service by our entire Vanderbilt community. “This recognition is a testament to our students’ academic excellence, our faculty’s deep commitment to world-class research and an unparalleled dedication to service by our entire Vanderbilt community,” said Vanderbilt Chancellor Nicholas S. Zeppos. U.S. News gathered data about each school in up to 15 areas related to academic excellence. Each indicator was assigned a weight (expressed as a percentage) based on U.S. News’ judgments about which measures of quality matter most. 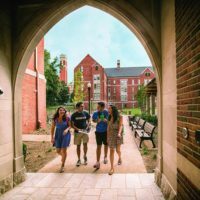 Vanderbilt did even better in the rankings for national universities that deliver a quality education at a reasonable rate, ranking 12th. This ranking compares academic quality and the 2016 net-cost of attendance for a student who received the average level of need-based financial aid. Vanderbilt also tied for No. 15 for economic diversity, evaluated by the proportion of students who receive Pell grants. Vanderbilt’s proportion was 14 percent, tied with Dartmouth and Yale. The School of Engineering was ranked No. 34, up from No. 37 last year. Vanderbilt also scored well in several other categories involving the student experience. It was included on a list of 29 universities that excel in delivering a successful first-year experience; a list of 23 schools that are preeminent in their offerings of service learning opportunities; and a top 40 list of schools providing undergraduate research and creative projects that result in an original scholarly paper or product.